A bipartisan pair of members of Congress set off on a road trip from San Antonio, Texas Tuesday, heading toward Washington, D.C. after they both realized their flights were cancelled due to the East Coast snowstorm. 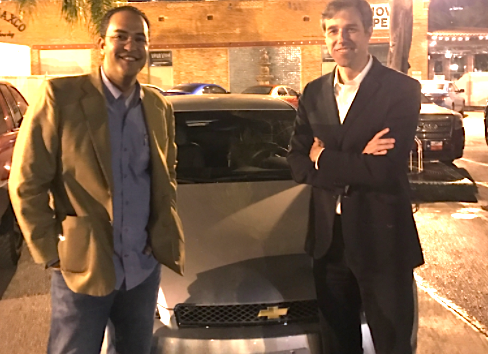 Rep. Beto O’Rourke, D-Texas, who represents El Paso, happened to be at an event in San Antonio Monday with Rep. Will Hurd, R-Texas, and they decided to rent a car together and hold a live Facebook townhall during their roadtrip. “I suggested that we rent a car, drive across a country, beat the blizzard by road and hold a live townhall while doing it,” said O’Rourke, who appeared to be behind the wheel. By early afternoon on Tuesday, they were five to six hours into their trip and about 150 miles into the more than 1,000-mile drive. They stopped in Austin on the way, and dropped by the South by Southwest conference. The duo said they expect to arrive in Washington in time for House votes on Wednesday night. They also said they’ve decided to drive through Memphis and Nashville. They both agreed that it’s good to hear someone else’s perspective and that when you get to know someone well -- like on a roadtrip -- you can have uncomfortable conversations and eventually find areas of cooperation on various issues. While they engaged in serious conversation, they also appeared to be having fun. They began asking for drive-through lunch suggestions as they hit traffic in Waco, Texas. CBS News’ Walt Cronkite contributed to this report.